Float Fish Farm Fishery has been very busy of late. In the Wednesday over 55s match on the Wagtail Pool the ever-consistent Stan Dow won from fancied peg 21 with 98lb 10oz caught on a small feeder with pellet. Runner-up with 67lb 5oz was Vince Hull and third Alan Wiggins with 60lb. 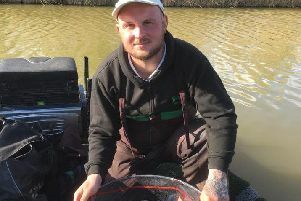 It was a real struggle for those fishing the Saturday Open on Two Islands, but matchwinner Roy Wells went home a very happy man after taking the pools money and also scooping the Golden Peg jackpot for winning off peg nine. He put a modest 24lb 10oz to the scales, all taken on a small feeder. Stan Dow came second with 22lb 4oz, thenit was Shaun Waterfall with 21lb 8oz. On Sunday Webb’s AC fished the Wagtail Pool at Float Fish Farm. Andy Perry found plenty of fish willing to feed on pellet and sweetcorn presented on a small feeder for a top weight of 34lb. Alan Forest came second on 23lb 4oz, again fishing a feeder, then it was John Brodie in third place with 22lb 14oz.